Make Christmas go off with a bang! Our Christmas Cracker arrangement contains red ilex berries and carnations, arranged amongst a fabulous selection of Christmas foliage and pine cones make this bouquet truly exceptional value for money at only £26.99! 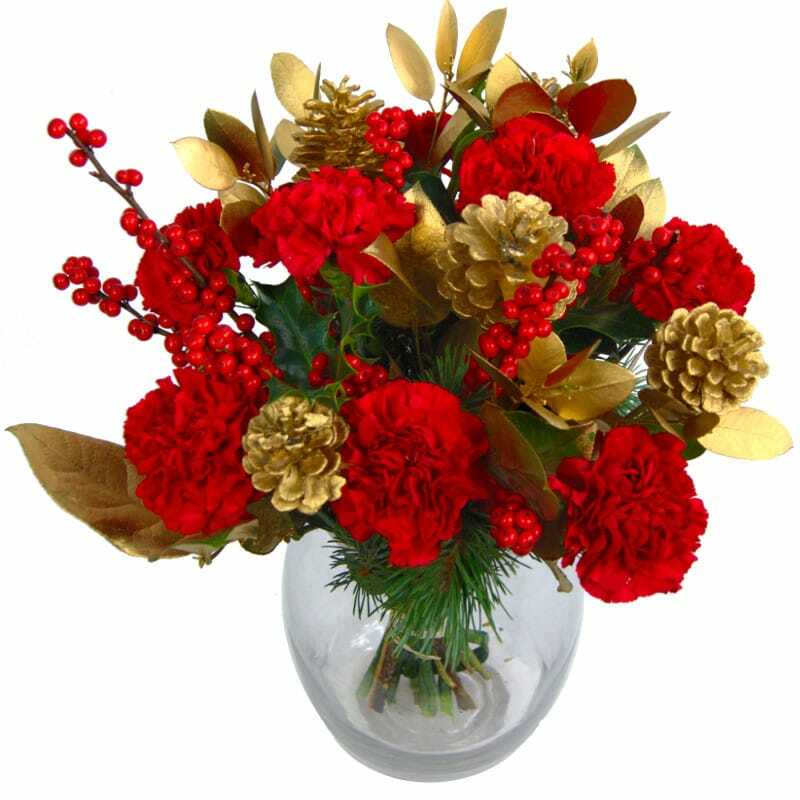 The glitzy gold of the painted pine cones and the vibrant red of the fresh carnations certainly make for an eye-catching combination. Whether you send this as a Christmas present for a relative or you use it as a decoration in your own home, the Christmas Cracker bouquet is sure to spread some festive cheer! Your flowers will be delivered in our special delivery box to prevent damage while in transit, so they arrive in excellent condition. For that extra special personal touch, why not add a Handwritten Greetings Card or a delicious box of Luxury Chocolates, a chic glass vase or an adorable teddy to accompany your beautiful fresh hand-tied Christmas Cracker Flower Bouquet. Our large selection of Christmas Bouquets and an array of different gift sets to suit every occasion. A cute and cuddly Christmas puppy replete with matching tartan scarf and hat! A cute and cuddly Christmas teddy replete with matching tartan scarf and hat!